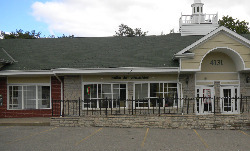 The Polka Dot Pincushion opened in 2005 in Richfield, Ohio, a small community midway between Cleveland and Akron. Our focus has always been on our customers who are the heart of the business. Everyone who works at the shop has her own area of expertise. We can help you solve your quilting or sewing problems, or we can help you begin a new project with advice on fabric and pattern selection. 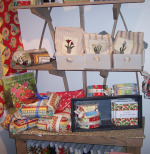 We offer many kits, ranging from table runners to full sized quilts. Our palette includes Asian-inspired fabrics, reproduction Civil War prints, juvenile designs, flannels, modern designers, primitive and whimsical designs and a large selection of blacks and whites. Embroidery and redwork enthusiasts will find many patterns available with a wide range of fabrics to finish your handwork. Hand dyed wools and patterns for wool embroidery both by hand and machine are featured in our shop. We try to have many block of the month programs each session of our newsletter. Quilts range in size and scope from fully pieced quilts, completely hand appliquéd quilts, embroidered quilts to small monthly wall hangings. Specialty groups centering on appliqué or other topics such as the Dear Jane quilt are also offered with monthly meetings scheduled. As our customer, we value the time you give to us. We want to help you make the most of the precious creative time you give yourself. Visit us often, either online or in the shop, for inspiration or help. Copyright © 2007-2019 - Polka Dot Pincushion Inc.